Bet you the last time you wanted to redecorate a room pink you were probably about 11. But after a decade or two of being associated with tweens' bedrooms, pink is most definitely back – and not just in sleep spaces. There are, however, a few rules for mastering this candy colour. First one being, avoid anything that vaguely reminds you of a colour Barbie would wear; blush-toned, muted pinks are the way to go. And keep finishes matte – anything shiny and pink, and you are entering six-year-old's bedroom territory again. So, with those little gems of wisdom in mind, keep scrolling for our favourite pink room design ideas (just try to stop your inner child squealing with joy). Looking for more decorating advice? You'll find plenty over on our design hub page. See, pink isn't always super-girly. Your home needn't look like the inside of a Polly Pocket house. Pair these sugary hues with a simple monochrome scheme for a grown up take on the trend. The bold print of the rug and the dark fireplace surround really work to ground the room, stopping it becoming too... pink. You can find a similar rug to this one at Wayfair. Pink was made for polkadots. Bear with us, we know what you are thinking. But just look how this pink spotty wallpaper has been used in this work space. By dividing the wall a quarter of the way up with a dark, earth green (try something like Farrow & Ball's Green Smoke), the overall vibe isn't too twee. Plus, combining it with a quirky vintage desk and Mid-century modern style chair only helps balance out the look. Let's move away from pastel pinks for a second. Yes, they may be having a moment but there are other pinks out there. If you are after a shade that's more... mature, pick a paint that has a warmer, duskier undertone. Something like Farrow and Ball's Sulking Room Pink, which has been used in this living room. Keep the look fresh by pairing it with bright, crisp whites. For more living room paint ideas, check out our full feature for tips and inspiration. Pink doesn't have to be a bold choice, you can almost use it as a neutral shade. In this kitchen you can barely notice the pinky hues of the walls. But how gorgeous does it look with the sage kitchen cabinets and gold highlights? Take our tour around the rest of this candy coloured kitchen. If you know your love of pink is going to stick around for a while (and that you're not going anywhere fast either), why not choose pink kitchen cabinets? We are in love with this kitchen from Naked Kitchens, the combination of the pink and deep purple cabinets is beautiful, and the light wood panelled walls? Dreamy. If you are doing up your kitchen on a budget, you could always paint your kitchen cabinets pink yourself. Just check out our guide to find out how. If you aren't ready to fully commit by painting your whole kitchen pink, try adding a few pops of the colour instead. You could tile a splashback with pink tiles, switch up your kitchen hardware or just incorporate some pink kitchen accessories. You could also pinch this idea and make a feature of a breakfast bar or kitchen island by tiling a section of it with pink tiles. Who would have thought that flesh-tones in a kitchen would ever be a thing? But when teamed with emerald tiles and deep blue kitchen cabinets it totally works. This gorgeous kitchen is from deVOL and painted in their Clerkenwell Blue. For a similar pink shade try Setting Plaster from Farrow & Ball. Another way to incorporate pink into your kitchen is the humble feature wall. They get a lot of stick for being a bit of a cop out option but when it comes to bold colours, committing to four walls just might not be an option. The splash of pink in this kitchen is the perfect combo with the navy cabinets, plus the well placed pink accessories only enhance the feature wall. Feeling inspired to paint your kitchen? Check out more kitchen paint ideas. Switch out your window treatments for ones that embrace the pink trend. If you have blinds around your house this could be a really cheap and easy way to add some colour. If you are after something more permanent, we love these shutters from The Shutter Store , the coral pink looks stunning in this simple dining room set up. Find out more about choosing shutters in our guide. Is there anything more calming than a blush, whispering rose colour in a bedroom? Super soft and adorably chic, the piled up pinks in this bedroom make it look so inviting. Add in some grey tones and metallic accessories for a match made in Pinterest heaven. Find more inspiring bedroom paint ideas. We couldn't not include this beautiful bedding from The French Bedroom Company! Also note the subtle colour blocking in this bedroom – using two similar shades that have just enough of a contrast adds interest to a room without becoming the sole focus. For more colour blocking ideas check out our design feature. Clearly we just can't get enough of the pale pink/dark navy combo. Recreate this pink decorating idea by choosing a bold patterned wallpaper and painting your woodwork in a darker hue. In this traditional bedroom, Sandberg's Marie has been used alongside Farrow & Ball's Railings. We've got loads of lovely bedroom wallpaper ideas if you are after more inspiration. Before you panic, we aren't suggesting that rag-rolled walls are making a comeback... no, they can stay firmly in the '80s. But there is something sophisticated about a plastered-coloured, subtly distressed wall. While you could recreate this unfinished look with paint, we think the easiest way is with a pink wallpaper. For a similar look, try Osborne & Little's Fresco . Clichéd as it may be, pastels do always tend to work in a children's room. 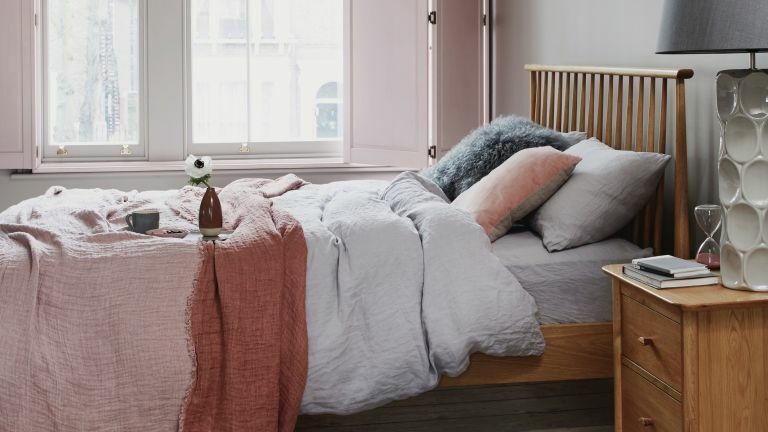 Unlike the Barbie pink of our childhood bedroom dreams, dusky pinks mixed in with grey and white create a really stylish space that your child and (more importantly) you, will love. Plus they are less likely to grow out of these more muted colours and they definitely have more staying power than hot magenta. Designing a kid's bedroom from scratch? Go and have a read through our guide for everything you need to know. If you want to add a little pink to your bathroom, try painting your vanity unit (check out our guide to painting furniture for some tips). Keep it looking modern by teaming pops of pink with boldly patterned monochrome flooring and an array of house plants. If you want to skip the painting, add a pink splashback. We love these glossy tiles from Tile Flair. We are all very focused on the colour of our front doors, but don't neglect what it looks like on the inside! Painting the inside of your front door could be all you need to add a subtle splash of colour to your hallway – and you can really easily DIY it on the cheap. Use our guide to painting a door to get your finish spot on. Another pink decorating idea for those commitment-phobes is to create a galley wall with a mostly pink colour scheme. That way you can incorporate some pink into your interiors but once you are over your fuchsia love affair you can switch up your photos and prints again. For more gallery wall ideas, head over to our dedicated feature. Dark floral designs are a big trend at the moment. Gone are the saccharine pastel hues you would normally associate with floral designs, this look is about gothic, lush, moody prints in deep inky hues (with the odd touch of pink, of course), and we love it. Surface View is our go-to for dark romantic floral design; they have a huge collection of wallpaper, mural and ceramic tiles. Love this look? You are going to want to check out these gorgeous floral room designs. Have fun with a pink room design and choose a quirky wallpaper print. This flamingo print from Cole & Son is an obvious choice! Not sure this quite counts as a pink room design... But the light from a neon pink sign bathes an entire room in a pinky glow, so we say it's all good. Make like Lisa Dawson and add a neon sign of your favourite quote to your hallway so you can show it off to every guest. You can have neon signs made to order from stores like Bag & Bones, but if you are on a budget, Amazon have some cute, cheaper offerings. For all its flamingoes and neon connotations, pink can also work in a more traditional space. If this bedroom is more your style, recreate the look by choosing a classic rose print wallpaper and matching throw cushions. Pick out a pink patterned window treatment and a floral bedspread and you are there. If you love the look of this bedroom, go and check out more of our beautiful traditional bedroom ideas. Who'd have thought that pink and yellow could look so cool together? While not quite contrasting colours, they both definitely bring something different to the party and we love how these mute plaster pinks work with the deep mustardy yellows – we reckon this colour combo could be a big one come spring and summer. Oh, and would you look a that? We just happen to have a round up of our favourite yellow sofas, should you want to recreate this look.